READ THIS! Seriously. Read this. And read it now! 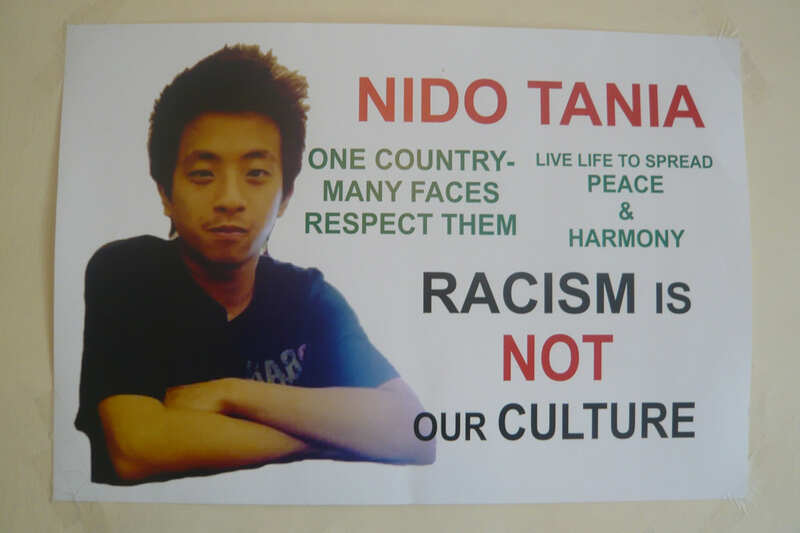 Last week, my friend Catriona Child wrote a very moving guest blog post about the death of Nido Tania, a young student from Arunachal Pradesh. If any of you haven’t yet read her beautifully written post, please (I beg you) do so right now by clicking on the link above, and then continue with her follow up post, below. Deeply committed to the North-East, Catriona has delved deeper into this tragic, heart-breaking story with more zeal than any of our national newspapers. Please feel free to correct me, but I haven’t read any newspaper report that comes even close to outlining the events that took place last month the way Catriona has. Read, read, read this – and then, yet again, I beg you to share it with as many people as possible. This story has to be known. Here is a truly excellent guest post – but on such a tragic subject. It’s always the same with newspapers. Stories that are not close to you are read over morning coffee with interest, anger or pleasure, depending on the content. Sometimes there’s frustration when a news item you’ve followed closely suddenly vanishes into a black hole with no updates. But when the event is something you have knowledge of or care deeply about, frustration knows no bounds. Then that you notice the contradictions, the misinformation and the omissions that pervade almost every article, even from respected publications. So it was with the story of Nido Tania, the student from Arunachal who was attacked by ruffians in South Delhi on 29 January 2014 and died from his injuries a day later. As it happened so close to where I live in Lajpat Nagar, I was desperate to understand. Why did an innocent request for directions from a 19-year-old student to a middle-aged shopkeeper go so horribly wrong, with dire consequences for all concerned? Was the vicious attack in Lajpat Nagar prompted by Tania’s blonde Korean-style hair, or because he looked Mongolian, or appeared middle-class and well-to-do, or a combination of all these factors? People from the north-east were adamant that it was pure racism; others less sure. The mainstream media did not help, leaving too many questions unanswered. Then on Sunday, three weeks after the incident, a detailed conversation with Tania’s paternal uncle Nido Jose Apil provided a version of events from the victim’s family and friends that the media had failed to publish. Here, more or less unembellished, is the story as related to me. On 29th January, an SOS comes from the sister of one of Tania’s friends to say that her brother (who lived in Lajpat Nagar) was sick and required immediate hospitalization. Tania and three friends set out to find the address: A 84 Lajpat Nagar 1. To locate the house they split into twos. Tania and his companion are directed to A83, which happens to be a small shop selling cheese and other goods. In the shop are the shopkeeper and three other men. Tania asks for directions to A84 (which confusingly is about 30 metres from A83) and explains that his friend is desperately ill and the matter is urgent. But, instead of helping, the men in the shop taunt him, “with your hair and chinky eyes you look like a monkey”. Stressed by concern over his sick friend and maddened by the fact that these people are making fun of him instead of answering his question, Tania breaks a very small glass close to the door. Two local bystanders decide to call the PCR van. The cops arrive and take Tania in the van to Lajpat Nagar Police station, telling his friends to disperse. They then put him on a motorbike between two police and carry him back to the shop at A83. Tania has the presence of mind to video himself on the motor bike. His face has obvious bruising, immediately raising the question as to why the police did not send him for a medical check-up at once. On returning to A83, Tania gets off the bike and is immediately attacked again, in full view of the police. He is now alone, without support, as his friends have been told to leave the spot. There is no witness for this attack. The police then take Tania and the shopkeeper back to Lajpat Nagar police station. CCTV footage supports this. On this second visit to the station, ostensibly to “settle the issue”, the police talk to Tania’s mother, Marina, and tell her that he has “been in a scuffle” and has had to pay 7000rs compensation. (Hmm – funny that – we already know that Tania has paid 10,000 rs to the shopkeeper. Where did that other 3000rs go?) At no point in the call do they inform Marina that her son has been seriously injured and she agrees to the police version of events. Freed at last, but still without a medical check-up, Tania and his friend went to a chemist shop in Krishna Nagar, near Safdarjung Enclave, to get medical supplies for their hospitalized friend, sometime after 5pm. CCTV footage confirms this. Tania then returns to his grandfather’s house in Green Park and reports the incident to his elder sister, who scolds him for getting into a fight. As we know, Tania sadly died the next day, from a serious head injury and subsequent oedema of the lungs, according to the autopsy. The report, according to the doctors, confirmed “death from violent beating”, which could, arguably, have been prevented had Tania received medical help sooner. Shockingly, before the autopsy report was published there were press reports that the death could be due to drug overdose. Totally irresponsible journalism and another example of stereo typing and racism, say Tania’s family. And the tale of apparent incompetence and cover-up continues. If we wonder why bystanders are reluctant to intervene or call the police in Delhi when acts of violence are perpetrated, then we should ponder the case of the two brothers Prem and Sumit (names changed) who called the PCR van to the second attack on Tania. You may not be surprised to hear that when they were called to Lajpat Nagar Police Station to give their statement, they were arrested and put behind bars by police under pressure from the Home Ministry to make an arrest. Local people say that these brothers are responsible citizens, who had previously saved two couples from attack by drunken gangs. Tania’s family are determined that no innocent person should suffer as a result of the tragic events of January 24 and have therefore insisted on a CBI enquiry. The death of Tania is a disgrace and a tragedy. Some people would argue that the same abuse, from violent mobs and from the police, could have been meted out to anyone in Delhi irrespective of class or creed. But I believe the above account clearly shows there were racist elements in the terrible events of January 29. The attackers are clearly culpable and it seems pretty likely that the police are gravely at fault. I believe we must also condemn a lazy media who are too often guilty of shoddy reporting of complex and deeply sensitive problems. Catriona, thank you so very much for this. Now, please do your bit, and share this with as many people as possible. This poor boy – and now his poor bereaved family – they all deserve this much, surely, that Tania’s story be known? As some of you know/will have noticed, I have a gremlin at work, which seems to want to stop posts being shared or liked on Facebook. I am trying to figure out what has gone wrong, but in the meantime, if you are indeed kind enough to like this post and/or want to share it, then won’t you please use the button at the top left hand side of the page – a specific Facebook button? 1 comment to READ THIS! Seriously. Read this. And read it now! thank you for this christine… this is responsible reporting indeed. thank you!